Pencil signed by the artist (?) below the image borderline at left. 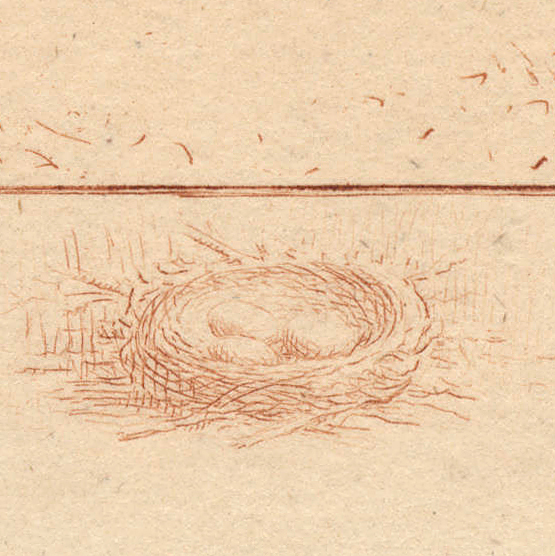 Remarque featuring three eggs in a nest below the image borderline at right-of-centre. Stamped with violet ink by the Société des Aquafortistes below the image borderline at right. Condition: well-printed impression with full margins in near pristine condition (i.e. there are no tears, holes, folds, abrasions, stains or foxing). I am selling this exceptionally rare pencil-signed, remarque proof by a sadly overshadowed French master who was taught the great masters, Charles Courtry and Félix Bracquemond, and who is best known for his graphic interpretations of paintings by artists within the circle of the Barbizon School—his most celebrated etching is arguably after Jules Breton’s famous “Gleaner” (1877)— for the total cost of AU$138 (currently US$105.97/EUR91.43/GBP80.83 at the time of this listing) including postage and handling to anywhere in the world. 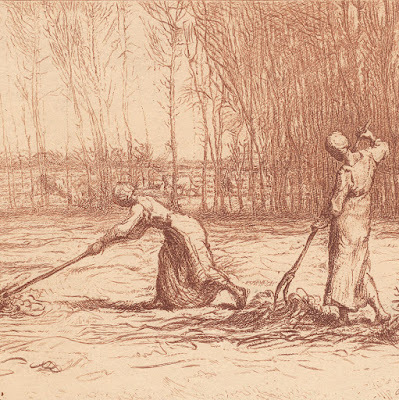 If you are interested in purchasing this delicately luminous print of women raking, please contact me (oz_jim@printsandprinciples.com) and I will send you a PayPal invoice to make the payment easy. Although Dautrey is one of many nineteenth century reproductive printmakers whose name is now almost forgotten, one look at this seemingly simple etching shows what masterworks have been hidden by the gate-keepers of history. This print may be a graphic interpretation of Millet’s artwork but to my eyes it has qualities that express more than an objective representation. For example, I see and feel the softness of light illuminating the scene (my apologies for those who know that feeling light is impossible). Moreover, I also sense the open space surrounding these women and can almost taste the dust and grit in the air (again, more apologies for what may well be the impossibility of tasting anything when simply looking at a print). 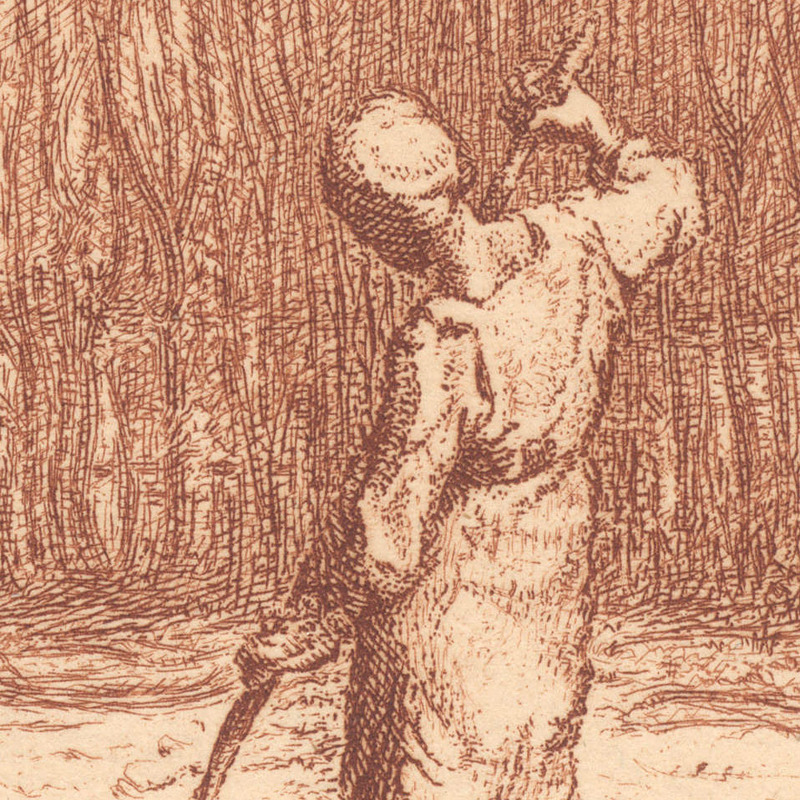 Regarding the simply drawn/inscribed very beautiful remarque image (i.e. 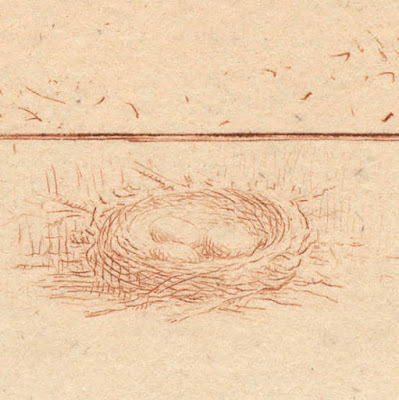 the small image of three eggs in a nest shown below the image borderline) such a small study usually serves the purpose in trial proofs where an artist can test the “biting”/etching strength of the acid/mordant in relation to the length of time the plate is left in the acid. In this case I feel that Dautrey may be stretching the truth that this impression with the full publication line lettered at the top is a trial proof. Of course I may be wrong and the pencilled signature may attest to its special status as a before publication proof. In reality, however, common practice at the turn of the 19th century regarding the information presented on a print when it is released on the market did not always reflect a noble ethical standard. Indeed, because the rarity of remarque proofs tended to be worth more on the art market, artists were not immune to the idea of “forgetting” to remove remarques when they the print was formally published. 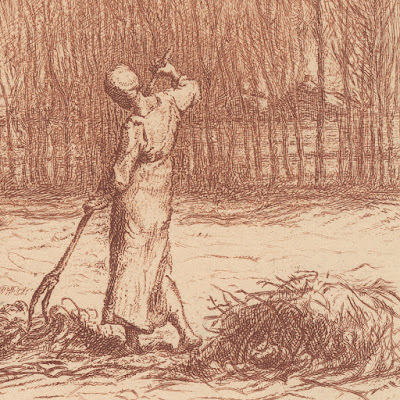 Is it possible that this an interpretation of Millet meant to look like an actual Millet? The two woman seem like they are from different elements of JFM paintings and the trees also seem separate to me. 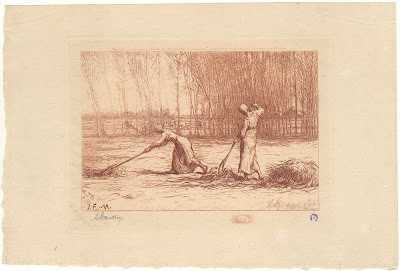 I found another, related print of a couple lifting faggots (perhaps this was part of a pair or a series?). 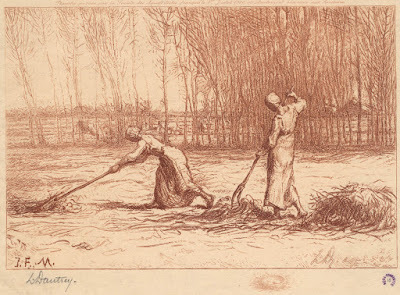 It also has aspects of Millet's paintings but doesn't seem to be a direct copy. Maybe I'm wrong about this and someone will come up with a better proof. I kind of like that it feels close to an original print. Thanks Mark for trying to find the original painting. Regarding my use of terms for etchings like this that are reproductive copies of other artworks, I use the word “interpretation” to propose that the copy offers another artist’s creative vision of it rather than a feature-by-feature recreation of the original. My use of the term “translation” is when a painting with all its colours and brushstrokes or a three-dimensional artwork (sculpture, pot or piece of lace) is recreated in a print. I probably use other terms as well that aren’t surfacing in my head at the moment, but the descriptive term that I tend to avoid is “reproductive print” as it needs a full explanation to avoid suggesting that a copy is a photogravure or photographic reproduction. Understood. I guess I was falling short of wondering whether the print was perhaps meant to "entice" the buyer into believing they were getting a Millet copy or if it's meant to be an homage? It's just interesting that he uses the "JFM" signature so boldly. Of course my theory goes out the window if a drawing of this image turns up. 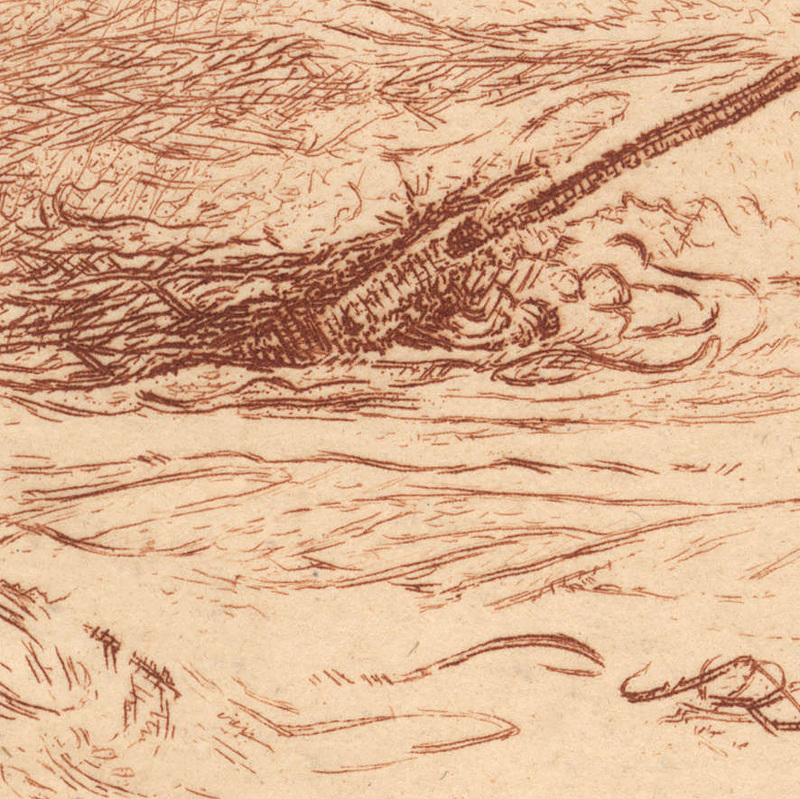 I'm completely captivated by this print (as you know!). It has a motion that's so different than Millet - whose figures seem to be taking their time doing their work. 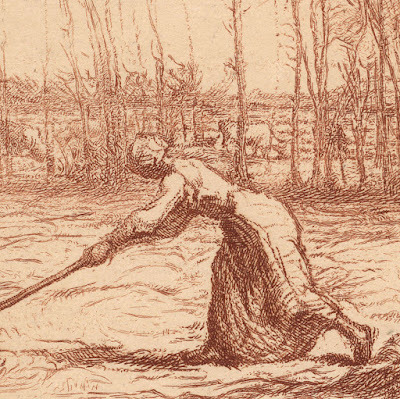 It's like the difference between van Gogh's drawing of the Diggers and Millet's print.